When I was a cheap grad student driving an older car, I also said something similar as a rationale for not getting winter tires. I didn’t want to buy dedicated rims for a car that might only live another three or four years. I didn’t drive to work so I could always plan my driving to avoid the worst winter storms, and I mostly drove on the highway which was excellently plowed. Well, of course none of that was really true: there were always the storms that came in by surprise (or because I didn’t always check the forecast), or the times when it was important to brave the weather, or the times when most of the route I wanted to drive had been plowed and salted, but part of it was slushy or icy. And even driving carefully there would be a time or two when instead of stopping at the line as I meant to, I’d stop in the crosswalk. Or I’d slip and spin the wheels trying to get started. Never with anyone there, thankfully, but visceral reminders that you can’t cheat winter. Finally, my tires needed to be replaced. And at the time a new kind of tire was on the market, an “all weather” tire (vs “all season”) called the Nokian WR. They’re good enough in winter conditions to earn the mountain+snowflake mark of winter tires, but the rubber stays hard enough in the heat that you can drive them all year long, so no need for a second set of rims and twice yearly change-overs. They were such a huge improvement over all seasons in winter driving. So huge that I didn’t need fancy equipment like tape measures and controlled conditions to see the difference. It was like night and day in the ability to drive, and I was never going back to trying to muddle through winter with all-seasons (or “three seasons” as called by car buffs). Now, they are a bit more expensive, but for the amount of safety edge they give you, it’s really cheap. And important – I definitely recommend them to everyone. After all, “Tires are the sole point of contact to the road. Do not underestimate their importance.” And I used the words “night and day” above – go and find people who have put winter tires on their car and see how many express the increase in traction that way. Yes, it’s anecdotal data, but try to find the number who say “meh, I’m not sure winter tires were worth it.” I could find a few such opinions online, but in person everyone I knew who had got winter tires was satisfied with the value for them and would not go back. The only people who weren’t sure winter tires were worth it were people who hadn’t tried them. I idly speculated on Twitter that winter tires were possibly the second-best bang-for-your-buck when it came to safety, after seatbelts. Determining how much added safety you get is a bit of a tough metric to come up with, but we can bracket in the cost side fairly easily. For my Nokian WRs, they cost about $200 more, all-in, than the set of three-season tires I would have purchased instead. There was no hassle about changing them over, storage, etc. So if we assume that a car would need about three sets of tires in its lifetime, that’s about $600 total. For dedicated winter tires on my Prius, I paid about $850 for the first set, which included steel rims. Then, I had to either pay $20-30 each season for a change-over, or $100 for a jack and jack stands to do it myself (plus the hassle of actually doing it myself). However, the cost of the tires is offset a bit because while the winter tires are on the car, the three-seasons are not getting worn down. So the added cost of winter tires for a 15-year car lifespan would be about $850 for the first set, $650 for the next two sets, $600 for 30 change-overs, less $800 for saving a bit over one round of three-season replacements. $1950 all told over the lifetime of the car. Safety margin added? Huge. Tremendous. Just enormous. See this video (H/T Preet) for a demonstration of just how much extra traction winter tires provide (and don’t forget that even on clear, dry roads, the cold temperatures alone increase the stopping distance of three-season tires). What would some other bits of gear people often pine over for their cars for safety reasons? How about all-wheel-drive, which many people say they need for winter driving? Well, on a Rav4 adding AWD will run you $2,265 on the sticker price, and it will decrease your fuel economy by about 0.5 L/100 km. The total lifetime cost could be over $3,500. Safety margin added? Really not much. As much as people swear by AWD, it really does not add much on safety. If you can’t “get up and go” on two wheels, it’s maybe a sign you shouldn’t be driving, rather than that you need help from the rear wheels. Plus every car has all-wheel-stop (i.e., brakes on all four corners), so AWD sometimes provides a false sense of confidence when you get going, which is shattered when you try to stop. I’d take a FWD car with winter tires over an AWD SUV with three-season tires. Electronic stability control is another feature that adds a margin of safety in winter driving, helping you to keep steering in the direction you want to go and preventing an uncontrolled skid. This one also has a fairly high addition of safety. However, I can’t even find a set of models to compare to tell you how much extra it costs now because many manufacturers have made it standard equipment — and when I was thinking of ranking features by bang-for-the-buck, this one was one I thought might possibly beat out winter tires. Winter tires will cost a bit more money than three-season tires. However, they add a huge margin of safety to your winter driving. In terms of the bang-for-your-buck, they’re well worth the money in my opinion, the only thing you can optionally buy for your car that provides that kind of value. Plus you can think of them like insurance: you pay a bit more to get them and hope that you never need those extra few meters of stopping distance – you can still not drive like an idiot, but it’s there if you need it. Go ahead and ask around, this is one area where there is virtually zero disagreement from experts and those who have tried it. Winter tires are awesome and well worth the price. With winter-rated all weather tires now available, there really is no excuse to not at least have something winter-rated and better than a typical all-season. Not having storage or the ability to do a change-over is no longer an excuse, and the extra cost is so small that if you can afford to drive in the winter at all, you should be able to afford to drive on something decently safe. What if you really can’t afford it? Like, driving at all is barely within your grad student budget? This may be bad advice in the end, but if you need to sacrifice something on your car to afford the trade-off for all-weather cars, sacrifice an oil change. Many people change their oil twice per year – dropping one of those should free up the money you need to buy a slightly better set of tires. “How much CPP will I get?” is a common question, and an important one that will help feed your financial planning. You can get a statement detailing your CPP contributions from Service Canada, but unless you’re close to retirement this isn’t super-helpful for planning purposes because it’s harder to do what-ifs with it. Indeed, it will basically assume that you’ll continue earning at your current rate until a given age, which is not helpful if you’re trying to evaluate early retirement scenarios. Plus, it’s a fair bit of work for precision when you may just want a good enough estimate. There’s also a calculator at Service Canada that includes the CPP, but it’s web-based so not great for playing around with, and it doesn’t do a good job of incorporating changes to future income, nor does it appear to be updated for the coming changes to CPP (announced in 2016). So I’ve built a spreadsheet to let you do just that. Click here to download it (Excel) (updated for 2019’s YMPE). Keep reading for details on the calculations and how to use it. This came about because Sandi Martin came to me asking how to solve the problem of estimating the future CPP for people that would partially benefit from the changes to CPP announced in 2016 (which will be slowly implemented over the coming years). She had a spreadsheet for the old calculation, but I pretty much started from scratch to build this in. Having her sheet in front of me as I did so was helpful, and she was instrumental in the testing and trouble-shooting. This post by Doug Runchey was hugely helpful on the algorithm CPP uses, which is not as intuitive as you would think. Doug offers a service to calculate your CPP precisely, so if you need to know down to the last dollar how much you’re going to get, contact Doug and pay him to run that calculation for you. Simply fill out the boxes shaded blue, then scroll down to see how much your CPP is. The year and age should be self-explanatory. Dropout: You’re allowed to drop a certain number of years from your CPP calculation. This lets you have a few years of low/no earnings and still collect the maximum CPP. Right now you’re allowed to drop 17% of your working life (over at CPP it’s actually in months but the spreadsheet uses years). So the number of years that works out to depends on when you collect CPP. However, there are cases where you can use the child-rearing provision to drop more years — use this field to add those drop-out years, in percentage form. Note that if you’re adding years as a percentage, now you’re making an assumption on when you’ll take CPP, so the table at the bottom will have further approximations for you. Income: Enter how much you earned each year towards CPP. For years before 2019 enter the actual amount in that year’s dollars. For years after 2019, use real dollars. That is, if you’re earning $50,000/yr now (just a bit under the YMPE), and next year expect to get a cost-of-living raise only, enter $50,000 for 2018 — you’ll still be at the same fraction of that year’s CPP maximum. If you’re expecting a 4% raise — 2% cost-of-living, and 2% real increase in pay, then enter that increased amount above inflation for the future year ($51,000 in this example). And that continues for future years: if 10 years from now you expect to just pace inflation, keep filling in the same salary figure in 2019 dollars. Otherwise, have fun exploring your what-if scenarios for when you stop working, etc. Keep scrolling down past all the years to enter your income history, and you’ll find a little table with the results — how much you can expect to earn from CPP annually. This includes the bonus/penalty for waiting to take it/taking it early, so you can quickly see about how much you’ll get for taking it at different points. The calculation should give you your CPP benefit to the nearest 5% or so (several people have sent me their statements of CPP and even for those collecting under the old system, there are differences of ~1-3%). I’m happy with that level of good enough — after all, you can get about that much difference just from deciding whether to enter your age as of the beginning of the year or the end of the year. If you need more precision, lookup Doug Runchey’s service. CPP is actually based on months of contributions (and months of drop-outs, etc.). Here I’ve just rounded off (discretized) to years, which is going to cause a bit of discrepancy. This will also cause a slight issue in the table of results for taking CPP at different ages, as whole years of drop-out pop up at 62 and 67 (vs. the more gradual inclusion of drop-outs when you discretize to months). You can drop extra years for the child-rearing provision, however there are some extra rules about the dropping out that the spreadsheet doesn’t account for. If you add extra percentage drop-out for child-rearing, that’s not necessarily going to translate into the same years dropped out at each age for taking CPP, so it will be less accurate if you’re including extra drop-out years for disability or child-rearing. On top of that, there has been concern that the drop-out provisions wouldn’t apply to the enhancements, though with several years to the enhancement roll-out this may yet get patched. To assume the CBC article is how it will be (i.e., it won’t get patched), reduce your drop-out by ~33% for years after the full implementation. The five-year average rule for determining the pension payout is hard to apply in the future where the inflation rate is unknown, so I’ve assumed an inflation rate similar to that of the last 5 years. Why Doesn’t This Match My Service Canada Estimate? There are a few places where the government has put up CPP estimators. If you ask Service Canada for your CPP estimate, in the very fine print you’ll see a note about the assumptions used, including that they estimate that you will continue to contribute at the same portion of YMPE until age 65 that you averaged until the date of the statement. So if you had a few years off or lower-paying jobs in your younger days, you might only be averaging 0.9 or 0.8 of the YMPE, and even though you’re earning well over that now (and punched into the spreadsheet that you’d keep going at it to 65 at that rate), the government’s statement assumes a lower continued contribution. Similarly, some people assume that because they didn’t provide any info, the pension figure applies even with no further contributions, yet entering 0 for future years results in the spreadsheet results in a lower estimate. The Retirement Income Calculator they put up likewise has issues, not including the enhancements to CPP announced in 2016, as well as other issues. I was actually somewhat shocked as I went through this at how mis-leading the initial government release on the CPP enhancement was. I had seen the “upper earnings limit will be targeted at $82,700” in all the news stories — which sounds substantially higher than today’s ~$55k figure. What I didn’t see was that this figure was not in today’s dollars, but in 2025 dollars, and that they assumed a rate of inflation close to 3% (well above the recent experience) — in today’s dollars, the new upper limit is actually just $62,586 (14% higher). I was also surprised at some of the little things in the calculation, like that the payout is based not on the YMPE level when you start collecting, but a lower number (the average of the previous 5 years). I can’t fathom the point of this step of the calculation. Otherwise, I haven’t seen explicit information on precisely how the CPP enhancements will be rolled out, but have made reasonable guesses as to how they will be pro-rated. What are the CPP enhancements, you ask? In short, an increase to the maximum amount you can contribute to CPP (so it will cover more of your income if you earn more than the maximum now), and an increase to the amount of income CPP will look to replace (from ~25% now to ~33% for those in the future). These were announced in the summer of 2016, and will start being phased-in in 2019 over the course of 7 years. Version 2: Adjusted the age 66-70 calculations to keep using 48 years as the number of contributory years as part of the over-65 drop-out provision (see comments). Also rolled forward the calculations for 2017’s YMPE. Version 3: Rolled forward to 2018’s YMPE. Also added the year’s basic exemption (YBE), which has been $3500 for a while (my entire working life) — if you earn less than that, the sheet will now zero out your pension credit. While the exact CPP calculation is hard to dig up, every source I find indicates that yes, if you earn over the YBE you still get credit for the full amount of your earnings even though you only pay on the portion over that. That is, if you earned $4000 last year, you only paid CPP contributions on $500 of that, but the full $4000 is used to figure your pension credit (e.g., the example in this post by Doug Runchey, where someone pays $0.05 to get a pension benefit of $21/yr when just over the YBE). Version 4: No major changes, just rolled forward to 2019’s YMPE. 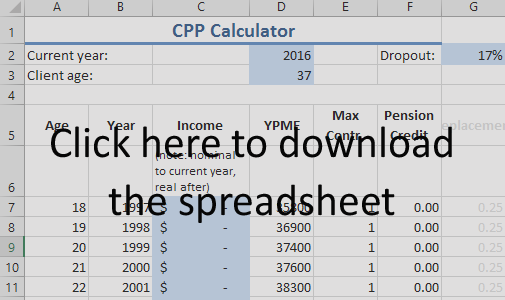 Once again, click here to download the CPP calculator (Excel). (click here for version 3, click here for version 2, or here for version 1). I don’t want to risk having my personal finance blogger license revoked, but I haven’t been paying attention to our budget as we deal with Wayfare’s recovery. I’m pretty sure we’re spending a bit more than average — we’re certainly eating more pre-made food, and spending more on drugs and parking and a walker, but much of that pre-made food is brought over by family and friends. I actually haven’t been thinking or worrying much about money the past few weeks, which is as it should be. Early on my mind would wander to the topic and I’d try to crunch numbers as I rode the subway, without the benefit of a proper spreadsheet. But at some point I internalized the message that we’ve got an emergency fund and we’ll be ok. So I stopped worrying and focused my energies elsewhere. And really, that’s what emergency funds are for, so you can make it through these completely random, crazy events without also having to worry about money in the short term. TTP is a very rare disease, with an incidence of about 3 in a million. But that means that next year about 100 families in Canada will be hit by this. Another 200,000 or so will face a cancer diagnosis. Some others will be hit by a job loss, or a major repair bill. As financial literacy month draws to a close I just wanted to quickly underscore how important it was to be savers when times were good, so that we could make it through a trying time like this. Yet many Canadians don’t have an emergency fund (here’s one survey that says a quarter have less than $1000). I mostly focus on investing stuff — it’s important too, and where I can actually make a difference — but emergencies can strike at any time. I don’t know what to say to all those people to get them to start, but having an emergency fund is important. I don’t know how we’d be handling this situation without it. You are currently browsing the Blessed by the Potato weblog archives for December, 2016. Blessed by the Potato is proudly powered by WordPress ♦ Entries (RSS) and Comments (RSS). ♦ 25 queries. 0.415 seconds.